When you select a range of cells, a small icon appears in the lower right corner of the selected area. This is the Quick Analysis icon, and clicking it opens a panel containing shortcuts to several types of common activities related to data analysis. 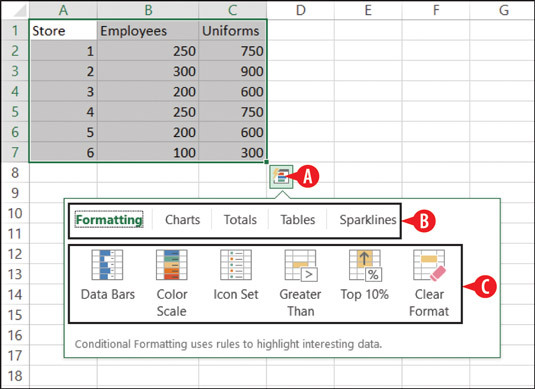 Formatting: These shortcuts point to conditional formatting options. For example, you could set up a range to make values under or over a certain amount appear in a different color or with a special icon adjacent. Open the Quick Analysis panel by clicking its icon. Then choose a category heading and click an icon for a command. Charts: These shortcuts generate common types of charts based on the selected data. Quick Analysis offers shortcuts for creating several common chart types. 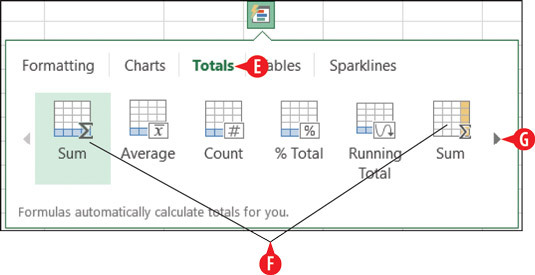 Totals: These shortcuts add the specified calculation to adjacent cells in the worksheet. For example, Sum adds a total row or column. Notice that there are separate icons here for rows vs. columns. Notice also that in this category there are more icons than can be displayed at once, so there are right and left arrows you can click to scroll through them. You can use Quick Analysis to add summary rows or columns. Tables: You can convert the range to a table for greater ease of analysis. You can also generate several different types of PivotTables via the shortcuts here. 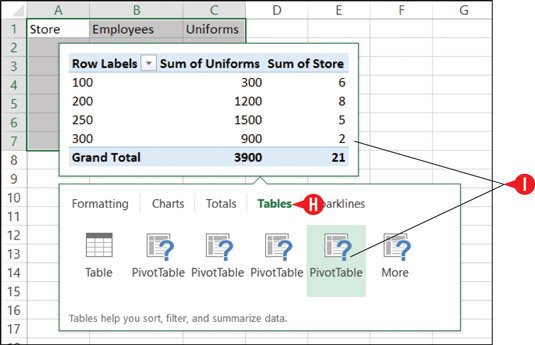 A PivotTable is a special view of the data that summarizes it by adding various types of calculations to it. The PivotTable icons aren’t well-differentiated, but you can point to one of the PivotTable icons to see a sample of how it will summarize the data in the selected range. If you choose one of the PivotTable views, it opens in its own separate sheet. You can convert the range to a table or apply one of several PivotTable specifications. Sparklines: Sparklines are mini-charts placed in single cells. They can summarize the trend of the data in adjacent cells. They are most relevant when the data you want to trend appears from left to right in adjacent columns. Choose Sparklines to add mini-charts that show overall trends.